Chris Young’s Joinery offers a range of choice for your benchtops for kitchens, bathroom vanities, laundries and entertainment units. Laminate is a very popular option, especially for those on a budget. It is relatively inexpensive and comes with a huge choice of colours, textures and designs. You’ll be surprised at the range of stylish colours, timber veneers and patterns. Easy to clean and maintain, but does not handle hot items in direct contact. Acrylic solid-surface benchtops are made of plastic blended with natural minerals, so the colour and pattern are consistent throughout. It has the ability to be made to appear like marble or granite, as well as coming in solid colours. 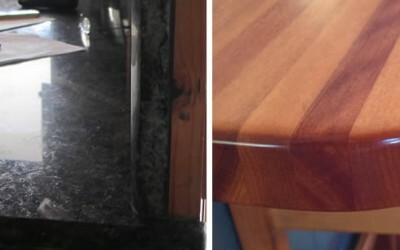 It can have no visible joins and dents, and cuts and scratches can be easily repaired. It is resistant to staining and very hygienic. A big advantage is that it can be used to create sunken or inbuilt sinks and draining boards, and it can be ‘coved’ up the wall as a splashback so there’s no join at the back edge. Timber benchtops are favoured for a rustic, natural look and feel. They provide warmth just by their presence. They can made from single slabs or by gluing differing grains and timbers together for effect. They are strong and long-lasting and won’t blunt your knives. However they are not heat or scratch-resistant and usually require regular resealing. Natural solid wood benchtops are produced in our workshop. Please discuss your needs with us. Granite is a hard stone that’s formed at very high temperatures deep within the earth. It comes in a range of colours and textures. It’s surface is usually finished with a high polish which is not affected by household acids, or scratching by knives and pots or pans. It’s also unaffected by typical kitchen heat such as hot pans, or spilled liquid. Granites do not usually need sealing or any ongoing maintenance, but damage can occur from heavy blows, particularly around the edges. 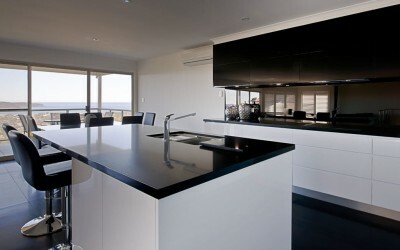 Please give us a call to discuss your granite benchtop. Engineered or reconstructed stone is made of quartz or granite granules, marble dust or glass chips mixed with a resin or polyester. 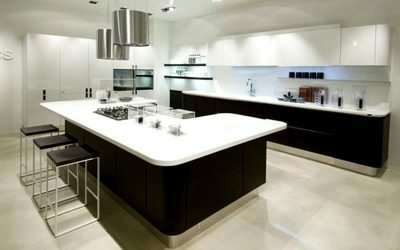 It includes the brand names CaesarStone and QuantumQuartz. Its appearance and durability have made it a popular choice. It gives the feel of stone without the disadvantages of stone. It is increasingly chosen for kitchens as it is unaffected by hot or cold objects placed directly on it. Common household chemicals don’t affect it either. It is also very difficult to scratch. It comes in a large variety of colours, textures and patterns. 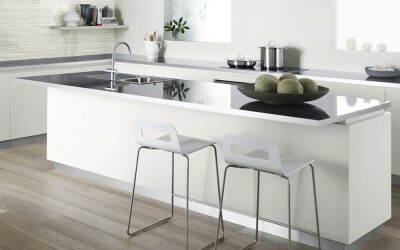 Suitable for benchtops, splashbacks, vanity tops and wall panelling. The edges and corners of your benchtop can be a variety of styles and can give a benchtop added flair. Corners are also an important safety and comfort consideration. A splashback should be waterproof and easy to clean. If you have a join between the splashback and the benchtop it needs to be properly sealed so dirt doesn’t collect there. Some benchtop surfaces, such as laminate, solid surface and stainless steel may be ‘coved’ to continue up the wall so there’s no join at all. Glass splashbacks are available in many different colours and designs, and are very easy to clean as you don’t have to worry about dirt collecting in the grout, as you do with tiles. They’re usually made from 6 mm toughened glass for strength and durability.